Kibaoni Gengetsu has finally revived and he drops the bombshell on Masakage Tsugomori and Ariake no Kata that Kyuuemon is his son with a concubine. She had given birth to him in secret 444 years ago. And on the verge of death, Gengetsu used his You-power to send him through time. This son’s full name is Kibaoni Kyuuemon Shingetsu. Gengetsu revives Gabi Raizou and the quintet is complete. With that, Gengetsu raises his castle out of the mountain and declares that they will take over the world with fear. Gengetsu tells his wife to rest and proclaims that Kyuuemon Shingetsu will take command. Kyuuemon sends Masakage off first. The Ninningers don’t want to waste any time, but Grandpa tells them to wait. He says they must take the final test first as well as make sure they are capable of taking on Gengetsu. Only one person can take the test at a time and the others will go fight Masakage. Takaharu will go first. But Yakumo senses Fuuka a little hesitant. While Masakage is downtown misting people, Takaharu and Grandpa begin the final test. Grandpa gets right to it, attacking Takaharu who quickly henges. Grandpa says this is a duel for their lives. But as they are watching, Masakage activates something and they suddenly feel a sharp pain in their head. Yakumo asks Fuuka if she’s worried about Taka-nii. She says no, but she just has a bad feeling. Yakumo says it’s natural to feel nervous about Gengetsu. But right now they can just focus on Masakage. One of the people enjoying lunch suddenly slams the table, upset that they would speak ill toward their great benefactor Masakage Tsugomori. Everyone stands, agreeing with him that Masakage has helped them in the lives. A cop points a gun at these two blasphemes and orders the others to capture them. Yakumo uses a spell to put them to sleep. 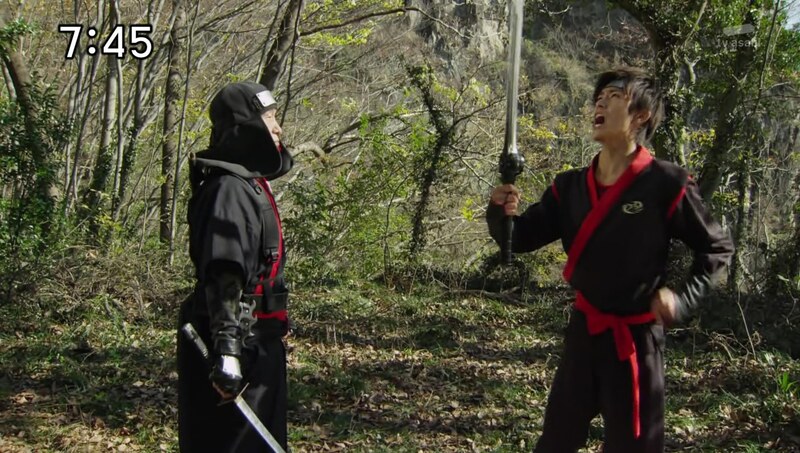 Back in the forest, Grandpa and Takaharu continue their duel. Grandpa acknowledges Takaharu has grown, but not enough to take his life. Takaharu says of course he wouldn’t take his life. 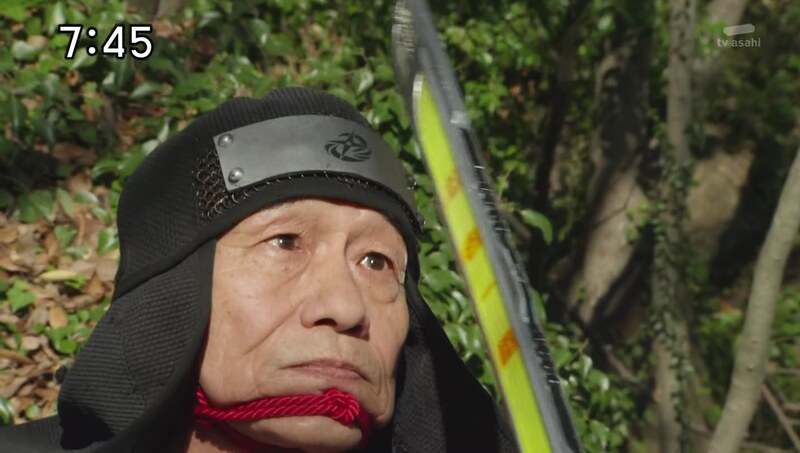 But Grandpa says Takaharu is gravely mistaken if he thinks he can become Last Ninja with that naiveté. 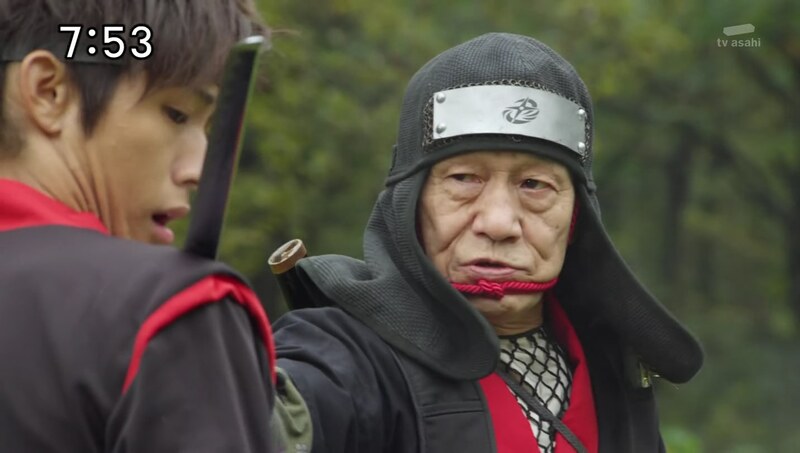 Grandpa unleashes a Final Strike at Takaharu. Fuuka wonders if they should call Oniichan. Their cousins jog towards them and wonder what Fuuka is talking about. Yakumo and Fuuka explain what happened. Kasumi, Kinji and Nagi all agree that it was a bad idea to badmouth the great Masakage. After all, it was Masakage who brought Kinji to Japan and got them Lion Ha-Oh to defeat the Karakuri Kyuubi. WTF?! That was Takaharu’s hard work, Fuuka protests. No no no. Kasumi, Nagi and Kinji figure Yakumo and Fuuka are being controlled by someone and they must be caught and dealt with. 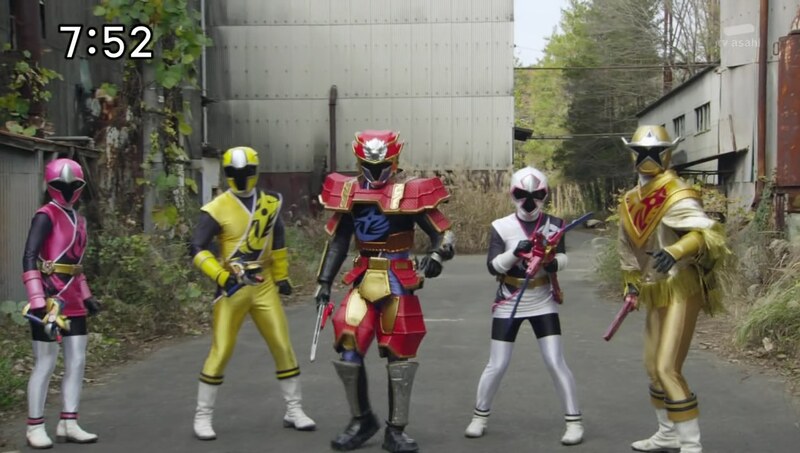 Yakumo and Fuuka run with the three following until they come face to face with Masakage. Yakumo shoots at Masakage, but Masakage instead mists them and gives them a show in the dark room too. Just like their cousins earlier, they get the brainwashing treatment. Masakage replaces Takaharu, a person they rely on, with himself in their memories. Meanwhile, Grandpa approaches a dead Takaharu… only, it’s actually a dummy. The real Takaharu jumps out of nowhere and gets his sword right at Grandpa’s face to excitedly score the point. But Grandpa says Takaharu hasn’t even finished him off yet. He is indeed very naive. Takaharu replies that it is Grandpa who is naive in that he won’t lose to such simple techniques any longer. Takaharu starts to go and join the others, but Grandpa stops him, asking if he worries more about the others than the test. Takaharu says no since he knows they won’t lose even if he’s not there. That’s why they let him do the test in the first place. Besides, Takaharu adds, it’s not much of a test when he has to beat his Grandpa when he’s not well. Takaharu wants to beat his Grandpa at his best. Masakage tells Fuuka and Yakumo that he has almost finished replacing their memories. But Fuuka says he is wrong. While Takaharu is a central figure in their lives, Fuuka will always see him as her reckless, no-good brother who she will always worry about. 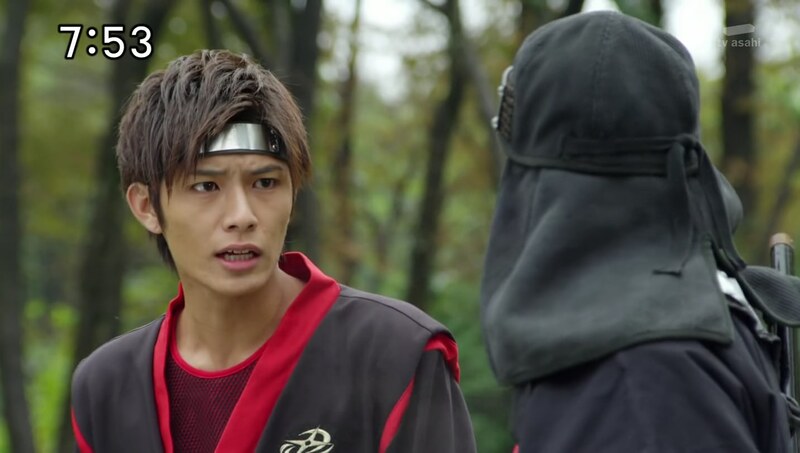 Yakumo says he doesn’t remember ever relying on Takaharu. 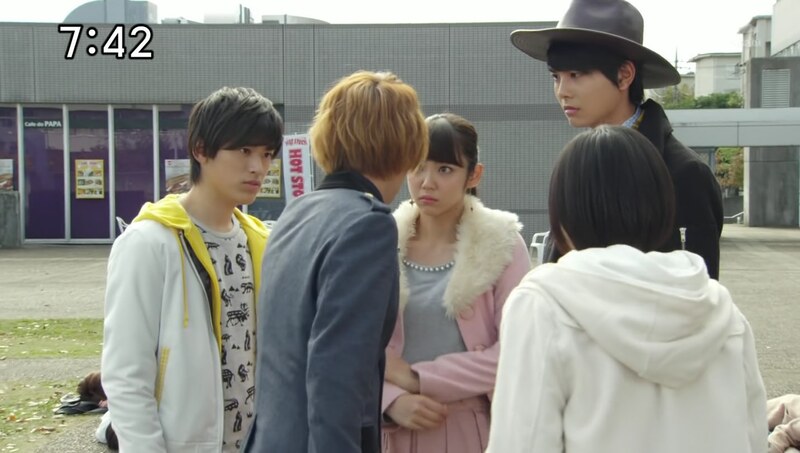 Yakumo tells Fuuka to remember all Takaharu’s failures. Instead of Takaharu wins, they remember Takaharu fails including getting scolded by Fuuka for fighting Kinji in the dojomanse, being scared of peppers and getting turned into a juggling pepper. Masakage doesn’t want to be edited into such failings. This opens the opportunity for Yakumo and Fuuka to break Masakage’s spell, releasing their cousins and the other people earlier. 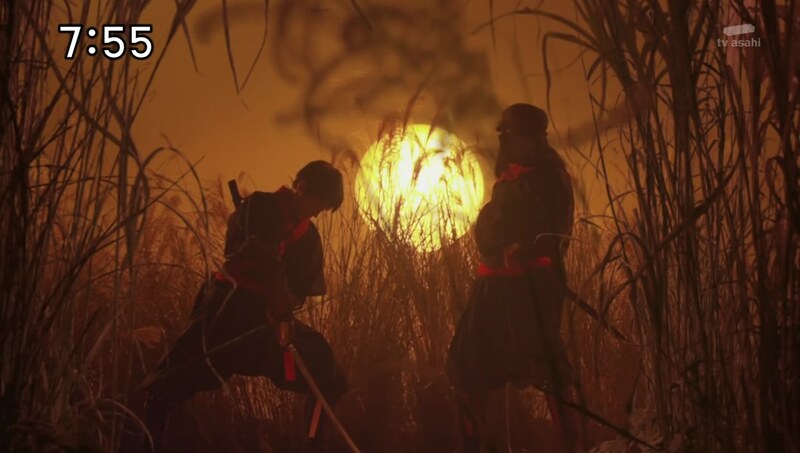 The Ninningers henge with Yakumo going Chozetsu and Kinji going Super to deliver what should be a big final strike at Masakage. But not even a scratch on Masakage. 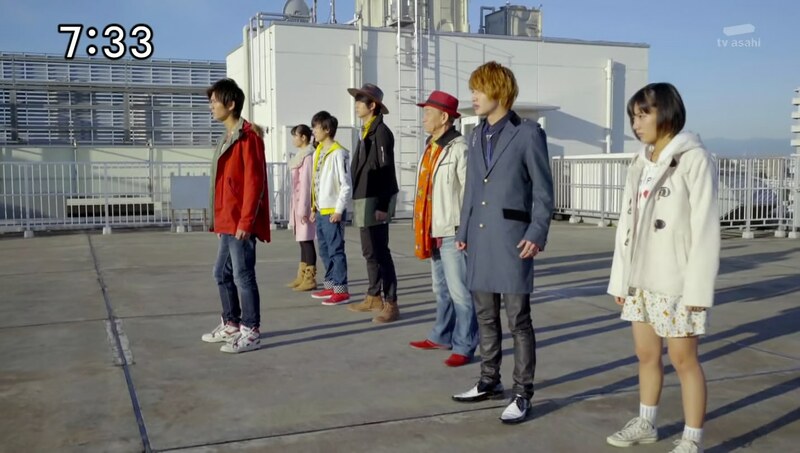 They remember it happened again before when Takaharu failed to kill him for good. Kasumi thinks there must be some karakuri to this, but Masakage just laughs that they will never figure it out. Yakumo uses a spell to reveal what’s in Masakage’s mind. Turns out Masakage is actually really small and just jumps into his big body’s face to control everything. Yakumo and Kinji grab hold of Masakage and Fuuka shoots right at Masakage’s face, revealing him. Maskaage decides to jump out and embiggen himself. x100! The Ninningers hop into King ShurikenJin. 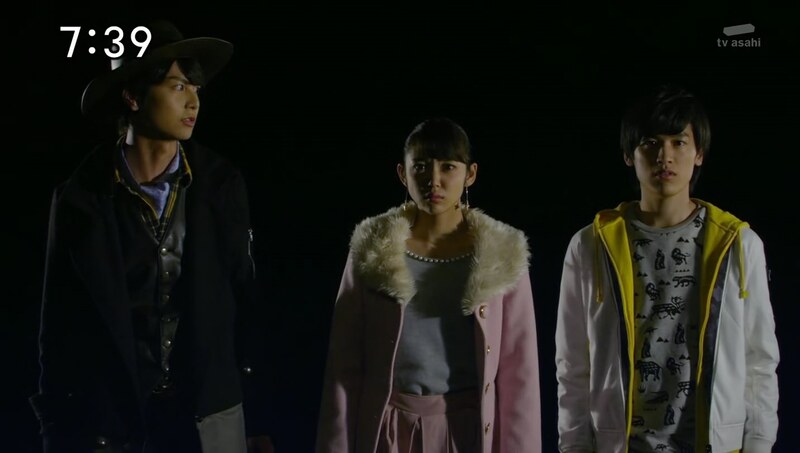 Takaharu sees his sister and cousins need his help. 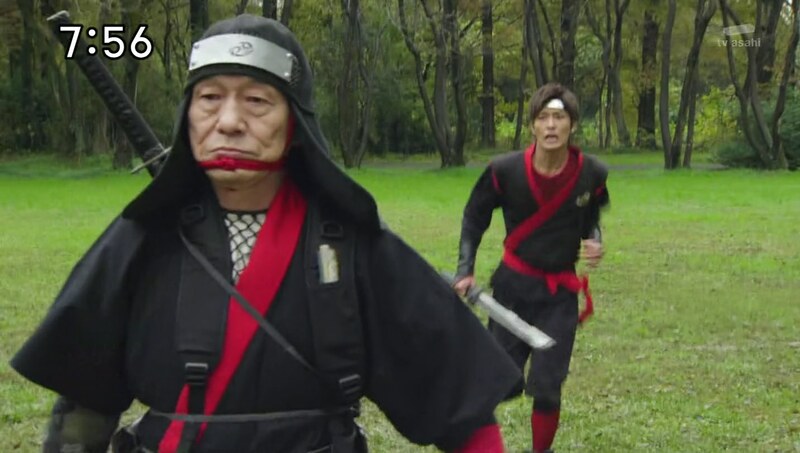 But Grandpa stops him again, upset at Takaharu’s arrogance in saying he isn’t in top form. There is no place for personal feelings like that in a fight to the death. Takaharu repeats that he doesn’t want to fight him to the death. And neither do the others. 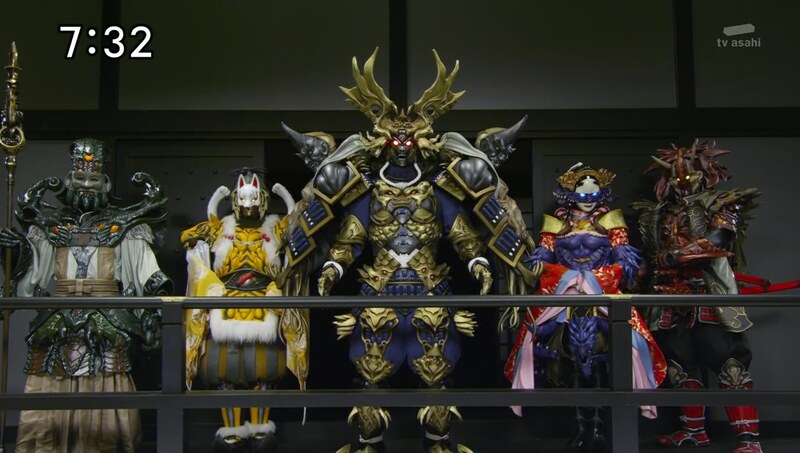 The cousins summon Lion Ha-Oh and deliver an Appare Buster to finish off Masakage for good. “So neither you nor the others can kill me?” Grandpa asks. “Of course not,” Takaharu says. If that’s the case, Grandpa says, then none of them are qualified to become the Last Ninja. The power of the Last Ninja comes from killing the previous one and taking his Nintality. Grandpa flashes back to killing his father. Takaharu can’t believe this shocking development. He tries to get Grandpa to explain further, but Grandpa just knocks him away. OMG what?! Okay, very interesting developments this episode. First of all I can’t believe it’s already been one year since ToQger and Yasuko Kobayashi made me cry like a little baby with all her manipulation of my feels. Ahhh. I miss ToQger. Even more now that Power Rangers has decided to skip it. Time flies. But second, I can’t believe there’s only three episodes of Ninninger left!! And the biggest shock being all you need to do to become Last Ninja is to kill the previous one. Say what now?! Very morbid turn of events on Ninninger, but I knew there was going to be something shocking here at the end. Again, the family aspect has been the best part of Ninninger. But I’m kinda sad we didn’t get this reveal earlier and maybe get one or two episodes showing how Kyuuemon did come into this time and then turn into a human kid to infiltrate the Igasakis. That’s at least two episodes worth of material there. So Masakage was an action figure this whole time?! I don’t understand! lol That was a very random development. I don’t seem to remember anything this season that would suggest he was just a tiny dwarf controlling a human-sized robot. So random. But I honestly thought we were going to get another recap episode with those Masakage highlight reels lol I was getting ready to be very upset. Especially after the three week break. Anyway, this was a good episode since there was a lot big story developments setting up the finale. Hope the action and the emotions get ramped up 10x in the final episodes. 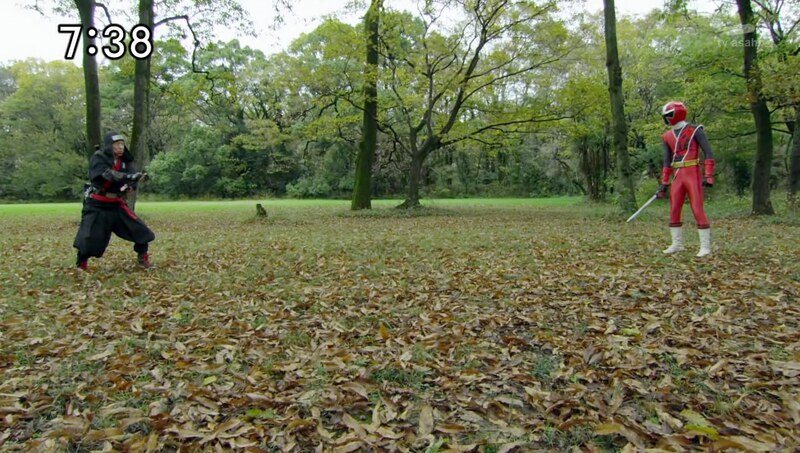 ← Recap: Kamen Rider Ghost, Episode 14 – Spectacular! The Dawn of the Earth!